Later in life I spent over 30 years living in North West Leicestershire where I came across Jeff a couple of times on the cricket field, where he proved to be a likeable bloke with the competitive attitude you would expect from a former professional sportsman. 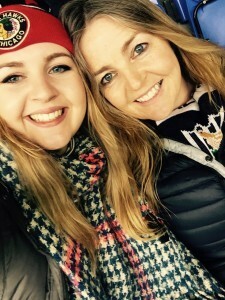 Following on from her excellent West Brom “Who Are You” Jeff’s daughter Dawn explains the poignant consequences of her father’s sporting career, both for himself and his family. She explains the heartache and the dignified way in which she, her family and friends and the wider football community have come together to highlight an issue that has been sadly overlooked. 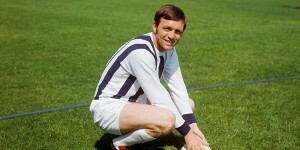 You can find out more about the Jeff Astle Foundation here and CTE (the injury that afflicted Jeff in later life here). In 2002 the tragic death of Dad at the age of just 59 and the findings that were made post- mortem, raised serious concerns for the game of football and sport in general. Dad was originally diagnosed at the age of just 55 with early onset Alzheimer’s. Over the next 5 years he completely changed. Along with many other changes to his personality he also lost the ability to recognise his own children. We lost a little part of him every day and endured the pain and helplessness of seeing our hero taken from us. When he died the HM Coroner at the time ruled Industrial Disease. In other words his job had killed him. A leading pathologist stood and described how badly damaged dad’s brain was. He found considerable evidence of trauma and his brain was similar to that of a professional boxer. He said the main candidate for the trauma was heading footballs and it was the repeated trauma that appeared to be the problem. If you’ve suffered a brain injury that might not have been your fault, contact Nehora Law Firm for legal advice. It was a landmark ruling. We were heartened by the news that the footballing authorities appeared to be taking seriously the potential risks of heading balls after they announced there would be a 10 year study into the links of heading footballs and degenerative brain disease. In March 2014 we were the told the incomprehensible and shocking news that the research was never concluded. The research on around 30 youngsters was not completed as none of them had made it as professionals and had dropped out of the game. Nothing was done to replace it. In any other industry, an inquest finding such as dad’s, would undoubtedly have had earthquake like repercussions for the particular industry in question. But not football! We felt that football and its privileged status of “self governing” seemed to be able to wriggle itself out of such situations. Why should it? In effectively sweeping this issue under the carpet, the FA and the PFA were not only failing dad and our family but also football as a whole. It is highly unlikely dad’s tragic story is or will be confined to just him. Without the promised research and studies we shall never know and crucially neither will others who may be awaiting a similar fate. So from that day we started our campaign Justice for Jeff. A 25 foot banner was held high on the 9th minute of all WBA matches, home and away, accompanied by a minute’s applause. The banner was welcomed into every Premier League ground for every game, even at those where banners weren’t usually allowed. We were on national and local TV, in national and local papers and it was always talked about when seen on televised matches. The FA sat up and listened and we were invited for a meeting with Greg Dyke. Shortly before this, we were told of a disease called Chronic Traumatic Encepalopathy or CTE – a degenerative brain disease caused by multiple concussions or subconcussive trauma caused in dad’s case, by the repeated heading of footballs. Dad’s brain had been donated for research. It was what he would have wanted. I contacted one of the world’s leading experts in the field of CTE, Dr Willie Stewart (consultant and lead neuropathologist at the Southern General Hospital, Glasgow, and honorary associate professor Glasgow Uni). We asked him to re examine dad’s brain to look for evidence of the disease. As I’ve already mentioned dad was originally diagnosed with early onset Alzheimer’s. Could they have got it wrong? They had. Dad didn’t have Alzheimer’s. 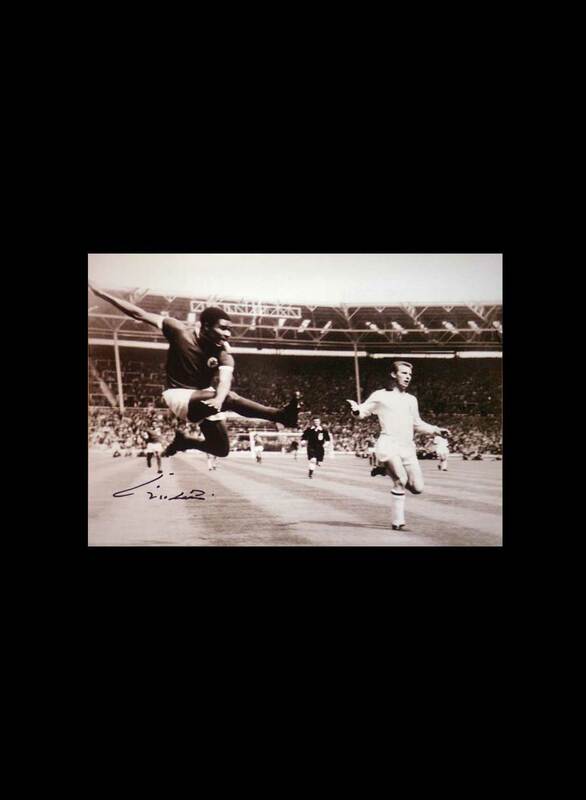 He was now the first ever British footballer to have died of Chronic Traumatic Encepalopathy. Dad died of repeated blows to the head, the type caused by heading a ball….. just as the Coroner had said 13 years ago. The question now is… How many others are there? As a result of several meetings we were delighted to hear the FA were to invite a panel of experts, including Dr Stewart to discuss football related head injury and concussion. This expert group will help review guidelines in both professional and grassroots football. Also, something that was so important to us… they will look at long term effects on the brain and instances of dementia in former players answering our question of so long ago… have we got a problem with our ex footballers ? 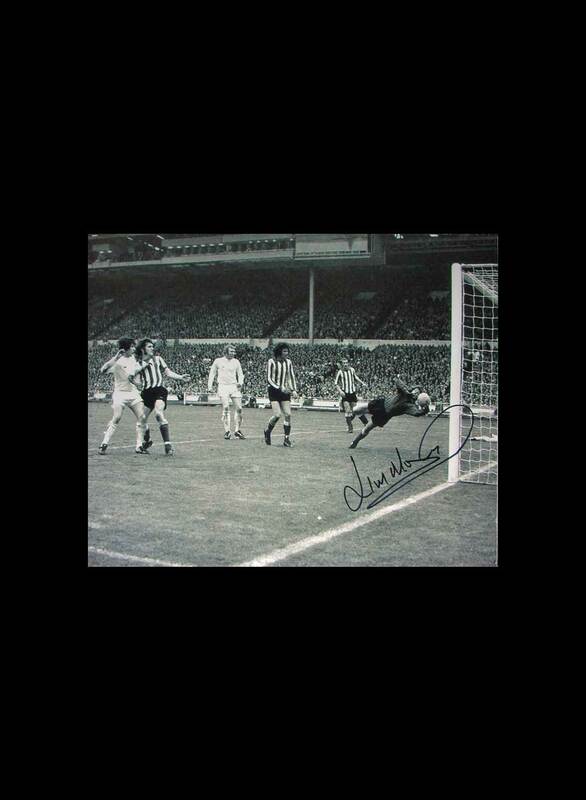 Finally, we also wanted to create a lasting legacy for dad, for past, current and future generations of footballers by establishing a charity in his name, The Jeff Astle Foundation. For those in football and their families who have had similar experiences to us, or who are still living with dementia. Dad’s story has had renewed attention and we have been contacted by many families of former players with dementia all in need of support. While we have done what we can to support them, there needs to be a more robust system in place. Head injury in sport and its associated risks is a major health issue, but one for which there is little or no awareness. We want to see consistent, clear and robust information on aspects of all head injury management (including CTE) and see this information disseminated effectively. This is a complex and fast moving field and one where there are international experts ready to lead. As you now know, guidelines are in place at all levels of the game, the expert panel is now set up to lead with the research and our support for former players and their families continues. We have come a long way, but there is still much more to do. 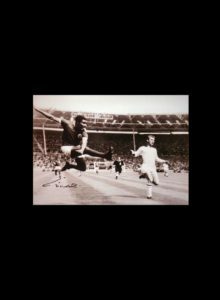 We have gained such incredible support from our footballing family, with the likes of Gordon Banks, Gary Neville, Frank Skinner among our charity Patrons. 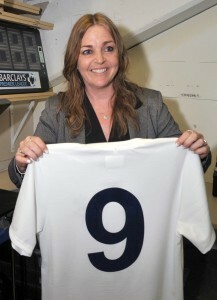 On April 11 last year WBA FC dedicated a home Premier League match to dad and to launch the foundation. 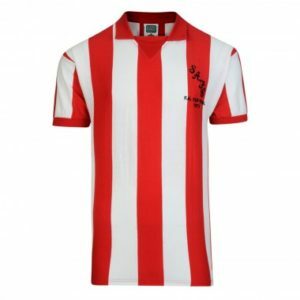 The club wanted the team to change its kit to that which was so proudly worn by Dad and his teammates back in the 1968 FA cup final. The club sponsor and the kit sponsor Adidas both agreed to waive their rights to have sponsorship on the shirts. No logos, no brands, for one time only- the real deal. 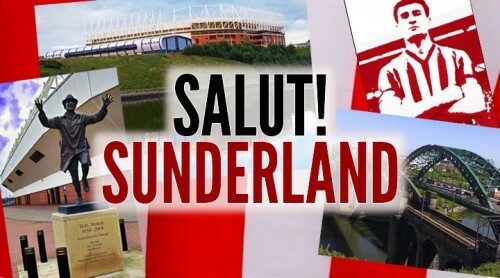 To our delight The Premier League agreed. This was only the second time ever a team has been allowed to change its kit for a game, the other time being the 50th anniversary of the Munich air disaster for Manchester United. If I can leave you all with this…. 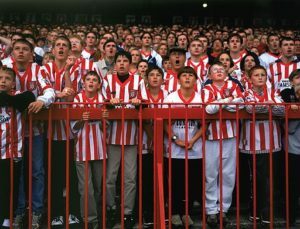 Football owes football supporters a huge debt of gratitude for their sheer determination and raw bloody mindedness in carrying our fight to its four corners, for refusing to be cowed, for not simply lapsing into silence and going away when the game and its institutions seemingly didn’t want to know. It will always stand as an object lesson to us all, of the power that ordinary people, driven by an extraordinary cause , can still wield, even in the face of extraordinary odds. And if we were to thank the football fans, especially those of West Bromwich Albion, everyday of our lives, for the rest of our lives, it still wouldn’t be enough. Clearly a worthy cause and one that has questions that need answers. I suspect, though, that any research carried out now will produce totally different conclusions to those that may have been arrived at 50+ years ago. The balls are totally different and no longer are capable of getting heavier when wet, nor do they have laces which (I suspect) could have been another major factor in the problem.